The annual presentation of honours and awards was held in the Common Room of University College, Cork on Monday 5th December 2005 at 7.00pm. The Deputy Lord Mayor of Cork, Cllr. Dara Murphy, attended. Nominated by: Mr. Robert Lyttle FÁS Sligo. Brendan has displayed a good all round ability in both the practical and technical skills areas of the tasks assigned to him on a number of pharmaceutical type projects which Suir Engineering are currently engaged in. James Spillane nomination for this award is based on his outstanding achievement in receiving the highest mark in the Higher Certificate in Science – Applied Physics and Instrumentation in 2005 at Cork Institute of Technology. His average mark was 77.4% and earned James a Distinction. Impressively in James’s case it could be ventured that this overall mark in itself does not do him justice, as he was consistently excellent across the entire range of subjects he took from Instrumentation and Control through to Physics. Indeed all of the marks James achieved in either the theoretical, practical, or project elements of all the subjects he took during the year, came in at above the distinction level of 70%. The Department of Applied Physics and Instrumentation in CIT has two four-year honours degree courses based on instrumentation and/or applied physics: the long established BSc in Applied Physics and Instrumentation and the new BSc in Computerised Instrumentation Systems from which the first students graduated in 2004. 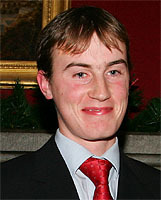 John Kiely received the highest mark in the BSc course in Applied Physics and Instrumentation (formerly the National Diploma in Science – Applied Physics and Instrumentation) in 2005 at Cork Institute of Technology. His average mark was 81% and earned John a Distinction. His highest mark in individual subjects was 87% for Process Engineering. Due to subject weightings this average cannot be computed directly from the marks shown on the transcript of his results. For achieving first place in the National Certificate in Applied Physics and Instrumentation Ð award stage, John Received the Janssen Pharmaceutical prize at the 2004 CIT Annual Science Awards ceremony. John is now studying for his BSc (Honours) in Applied Physics and Instrumentation at Cork Institute of Technology. Daniel received the highest mark in the BSc (Honours) in Applied Physics and Instrumentation in 2005 at Cork Institute of Technology. His average mark was 87.3% and earned Daniel a First Class Honours. 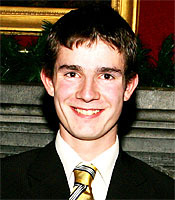 Daniel is now a post-graduate research student in the Quantum Optics Research Group in the Department of Applied Physics and Instrumentation at Cork Institute of Technology, having received one of the much sought after scholarships awarded by the Irish Council for Science, Engineering and Technology. For his final year project, Daniel commissioned and applied a scientific CCD camera imaging system. These systems are increasingly being used in research and industrial settings for a range of spectroscopy applications. The performance characteristics of a scientific grade CCD were studied so as to provide a solid basis for its commissioning. A number of experiments involving different light sources were devised in order to test the resolution capability of the CCD system. A LabView driver and image processing software was developed for the purpose of controlling these experiments. One of the key achievements of the project was the location of defective pixels which makes further development and application of the CCD camera system much easier. Daniel is now a post-graduate research student in the Quantum Optics Research Group in the Department of Applied Physics and Instrumentation at Cork Institute of Technology. Daniel is funded under the IRCSET Embark postgraduate scholarship to work on a Science Foundation Ireland funded programme of research. Daniel will be developing a manipulation scheme for the characterisation of spectral emissions from a microcavity laser arrays. There are two significant aims to the research. Firstly, the reduction in size of the devices used in telecommunications networks within industry and society and secondly, the development of miniaturised sensors for use within the biotechnology sector. The committee decided, that the nominations submitted did not merit the presentation of this award for 2005. 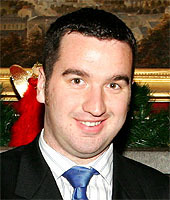 Recipient : : Mr. Eoin Ó Riain, Baile na hAbhann, Conamara. Unusual for a Dubliner he was educated by the Presentation Brothers both in Dublin and in Cork and even tried the life teaching with them in St Josephs on the Mardyke in Cork city for a short period in the mid sixties. He became formally involved in instrumentation with Industrial Instruments Ltd (IIL) in 1966 and has been involved ever since. When IIL closed in 1987 he started publishing Read-out. Read-out is by now the authoritative source of information and news in the instrumentation, control and automation community in Ireland. It has been published every two months for the last sixteen years. Originally the house magazine for IIL it was continued by Eoin on the closure of that company. 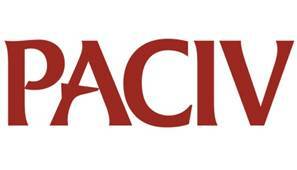 It is distributed by post to over 2000 named automation and instrumentation professionals throughout Ireland. In 1994 he started examining the internet as a means of communication and of publication and in 1995 the Read-out Instrumentation Signpost (read-out.net) was launched and was one of the first independent such resources on the world wide web. As use of the web exploded in the ninties so did the number of visitors to the site: from a few hundred a month in 1995 through 500 a week in 2000 to over 6000 a week today. This has expanded Read-out’s exposure in the world market and has lead to some international awards down the years. 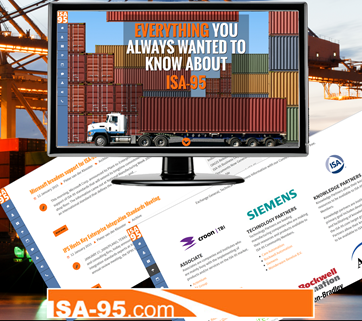 The site is particularly well known for its section of fieldbus technology and it also has sections on Safety and on Security. Another area where Eoin has developed a service is in the organization of occasional small seminars. Two Read-out Forums have been held to date, one on fieldbus, and the second on control and automation in the communications era. These forums have been offered to ISA members at reduced rates and a portion of the profits donated to the Ireland Section.Read-out has been a stalwart exhibitor at the annual ISA Ireland exhibition and Eoin’s pictorial reports on this and other shows are legendary. 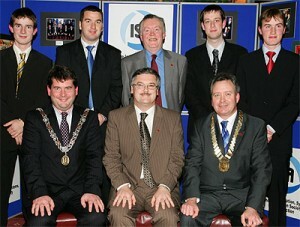 He has been a member of ISA in Ireland since its foundation in 1977. 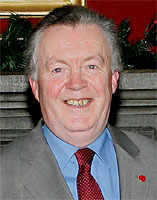 He served as president of the section in 1984/5, serving during the period when the very first ISA International Exhibition was held in the RDS. He has served on many committees since then in various capacities. In recent years he has acted as Section Webmaster . Internationally he has acted on several committees both at District 12 level (Europe, Middle East and Africa), and on the Publications Committee at society level. He is a Director on the ISA Publications Committee. Eoin is currently the District 12 Nominator. This position ensures that the District is represented in the selection of society officers. He also acts as District 12 Webmaster. Having lived all his life in Dublin he has moved to the Conamara Gaeltacht in the last two years where he continues to publish. Eoin is married to Máire and they have three children, Muireann, Diarmuid and Aoileann. Tonight we honour Eoin O’Riain with the Pioneer Award; He really has been a pioneer in the development of the Instrumentation industry in Ireland over the last Forty years. We also honour his dedication to ISA for thirty of those years where he has played a major role in developing the ISA mission in Ireland and throughout Europe. Sponsors of Honours and Awards 2005. Back row : John Downey RPS, Brian Nolan O'Sheas Electrical, Willie Cody Kirby Group, John Farrell Proscon, Pat Murphy RPM Resources, Eamon Creech Janssen Pharmaceuticals, Coleman Hess Pegler & Louden, Donal Grogin Valve Services, Noreen Murphy Capper Plastics, Billy O'Neill P M, Michael O'Mahony Capper Plastics, Gerry McAuliffe. Endress & Hauser Front row:, Brian Curtis ISA, Deputy Lord Mayor Cllr. Dara Murphy, President ISA Ireland Kevin Dignam and Billy Walsh ISA.